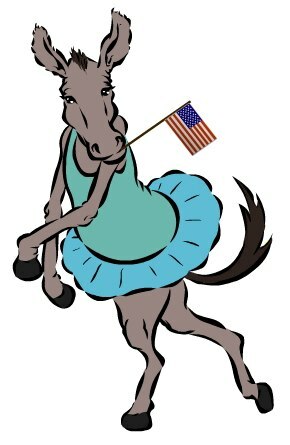 Just in time for the 2008 United States election season, our ballet donkey demonstrates "tendu back" to help you recognize this pose when you attend ballet performances. If you would like to use this illustration, please request permission by sending an email to editor@ExploreDance.com. This illustration was created for Robert Abrams Consulting LLC, the parent company of ExploreDance.com. Robert Abrams Consulting LLC builds web sites for many clients. This illustration is an example of what we can do for you.